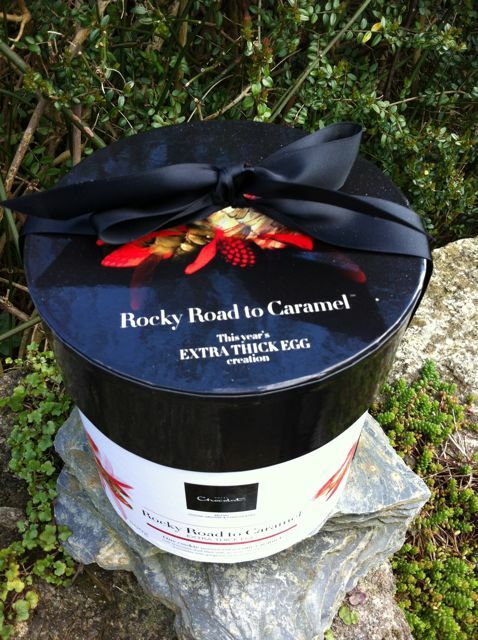 I have a particular weakness for caramel, so when I was offered the chance to review an Easter egg from Hotel Chocolat, it was this Rocky Road to Caramel that I chose. It wasn’t just the caramel that drew me of course, it was the lure of it being an Extra Thick Easter Egg. Do you remember those thick shelled chocolate eggs we all got as children? False memory syndrome most probably, but Hotel Chocolat have tried to address the issue. So? Two large milk chocolate egg halves wrapped in thick gold foil and contained in an attractive boutique style box that was somewhat reminiscent of a hat box, I thought. One egg half was covered with a rocky road mixture of crispy puffed rice, cookies and chocolate chunks and the other half with a layer of caramel chocolate. These were enough to satisfy the most voracious of chocolate appetites. The chocolate is the standard house 40%, which although sweeter than I like, is still way ahead of most of the high street chocolate available. Each egg half contained 6 filled milk chocolates making a total of 12 unique treats; some had familiar fillings and some I’d never tried before. They were mostly themed around caramel and praline with the odd truffle to ring the changes. I particularly enjoyed the Billionaires Shortbread which was a lovely mix of caramel, cookie pieces and praline. The Choc Chip Cookie was also fun: milk chocolate with whole hazelnuts and pieces of dark chocolate cookies scattered throughout. The Caramel Praline with pecan nuts was really delicious. It was slightly crunchy with a wonderful taste of pecans and caramel ending up with a strong hit of praline. I’m not quite sure why Dizzy Praline was so named, but it had a lovely rich hazelnut flavour and was not as sweet as some of the others. An Orange Praline was most enjoyable with a nice balance of orange to hazelnut. I was thrilled to see three liquid caramels, two of which were my favourite salted caramels, one in a milk chocolate shell and one in a dark one – mmmm. As well as a solid milk chocolate bunny, there was a really cute little chick (which I had thought was an owl until I read the description). I was still happy to bite its head off and was very glad I did as it contained crushed caramel pieces and Maldon sea salt – another big yum! Now to the burning question. Are those shells properly thick? Weeelllll! In parts is the answer. The edges were really thick and excitingly, I found them quite difficult to break. Some of the middle was also very thick, but some of it was really quite thin. I’ve taken a picture of a broken half so you can see. But I wasn’t disappointed, the shell was a lot thicker than most and would have been difficult to eat if it had been as thick as the outer edge all the way through. That looks so so good-must order one-for a present-oh what the heck it’s going to be for me!! I’ve been instructed to purchase one of these the day after Easter Monday (when they’ll probably be half price). Lucky you getting sent one to review: looks veh nice. OMG I wish I had ordered that now – I tried the sleekster egglets which were very good but this looks better! Mmmmmmm! I’m coveting these Ostrich eggs so much! This is my fave, hope the Easter Bunny is good to me this year! This looks so luxurious. I would need to be a very good girl to receive one of these. Got this for my daughter – her reply was ‘This is what I would like next year please!’ I didn’t get a sniff!